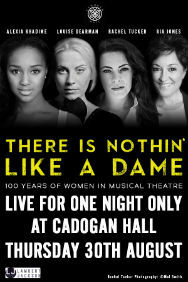 Celebrating 100 years of women in Musical Theatre, four of the most iconic West End’s leading ladies of our time come together for one night only as they journey through the last century of musicals. Louise Dearman, Ria Jones, Alexia Khadime and Rachel Tucker will blow you away with their never-before-heard renditions of some of your favourite songs in a once in a lifetime concert. From Porter to Lloyd Webber, Hammerstein to Schwartz, hear these ultimate musical show-stoppers sung by some of the best actresses of our time. Upon exiting Sloane Square Station, turn immediately right, passing the Royal Court Theatre. (You will see Cadogan Hall&rsquo;s tower immediately before you). Cross over Cliveden Place and walk up Sedding Street to the Hall.